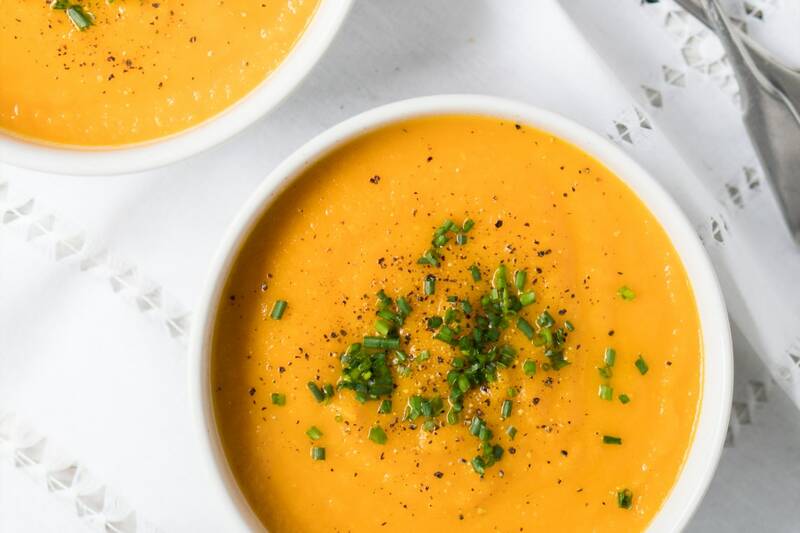 If you've ever had the carrot-ginger salad dressing served at many Japanese restaurants, you'll love this vegetarian soup. Sweet cooked carrots are brightened up with zesty ginger, chopped garlic and freshly grated lemon zest. 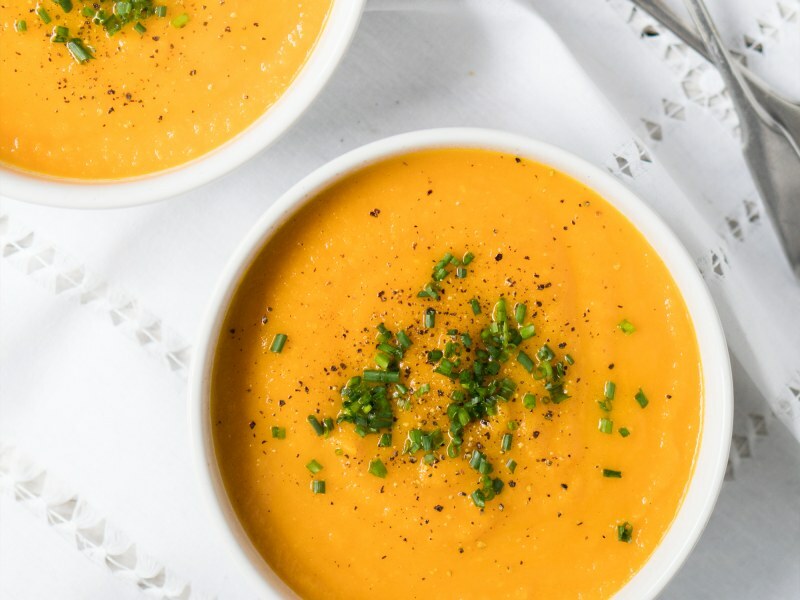 To avoid having to puree the soup in batches, use an immersion blender placed directly in the pot to blend the vegetable mixture. Don't skip the chopped chives—they add savory flavor and texture contrast to the creamy soup. For a slightly more indulgent meal, serve the soup with crumbled feta or goat cheese, homemade croutons or toasted bread. Don't be afraid to experiment with spices. Add a teaspoon of adobo sauce from canned chipotle chiles, a dash of Tabasco, or a squeeze of Sriracha. For a Mexican-inspired take, try substituting lime zest for the lemon, and add a teaspoon of ground cumin. Per Serving: 175 calories; 12g fat; 16.4g carbohydrates; 2g protein; 31mg cholesterol; 806mg sodium. Love. It. I got daring and used some preserved lemon zest in addition to the regular lemon zest. Gave it a really nice zing! I made this carrot and ginger soup because I was coming down with a cold and wanted something delicious, wholesome, and comforting to make me feel better. It most certainly helped, but aside from that, the flavors are phenomenal. The lemon and garlic added the right about of zest. I loved everything about this soup. Delicious carrot and ginger soup, but I did use chicken broth instead of vegetable broth. It’s great for spring, especially if you enjoy carrots. Hearty and satisfying with the right amount of heat. I made this because I wasn’t feeling well and I wanted to eat a comforting soup without the excessive sodium of canned soups. The soup turned out amazing! I added a pinch of nutmeg to the soup and finished it with a drizzle of olive oil. Yum! I will definitely make this soup again.